the possession of Josef Jakobs. The farm field in which German spy Josef Jakobs landed on the night of 31 January 1941 was most likely enshrouded in unrelieved darkness. The waxing crescent moon was hidden behind clouds and British wartime regulations ensured that farmhouse lights were hidden behind blackout curtains. 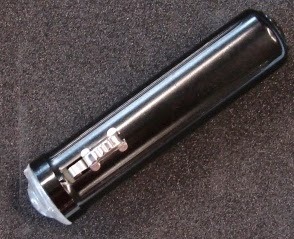 Josef was equipped with two items which would have helped to relieve the darkness: a cigarette lighter manufactured by Karl Wieden and a small torch/flashlight. Josef Jakobs. Held at the National Archives. The electric torch was powered by a battery and could give off an exceptionally bright light. The torch was also equipped with a flashing device which, in the opinion of MI5 officers, was intended for signaling enemy aircraft. Given the fact that Josef had broken his right ankle while leaving the German aircraft, he had no opportunity to do anything other than lie where he had landed. 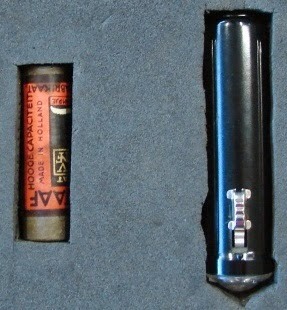 While it is unknown if Josef used the torch to look around him, it is clear that he used his cigarette lighter to light a steady supply of cigarettes. By the time he was found the following morning, the lighter was empty and the torch was useless to him.